For some people, the holidays are a joyful time, one they look forward to all year long. But this isn't the case for everyone, and there are a number of organizations in Pittsburgh that try to make the holidays as happy as possible for people who are in need. One of those organizations reached out to our law firm recently. East Liberty Family Health Care Center planned on giving gifts to over 400 children, but their toy drive donations fell through at the last minute. They were looking for any kind of help to make sure they didn't disappoint the kids on their list. The employees at our law firm stepped up in a big way. In just a few short hours, the firm raised enough money that the health care center was able to buy toys for all of the children – in fact, they spent over 10 hours toy shopping the next day. That wasn't all. 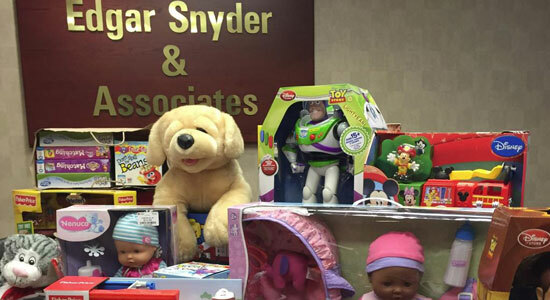 A few days later, our employees also contributed toys they bought to the toy donation. Because the East Liberty Health Care Center filled their need, we were able to give those to the #pghsaveschristmas effort, a city-wide emergency toy drive. We're proud to live in a city that worked so hard to bring joy to local families during the holidays, and we're happy that we got to be a part of it. We wish everyone a happy and healthy 2015.